Combine the flour, baking powder, baking soda, Italian seasoning and garlic powder. 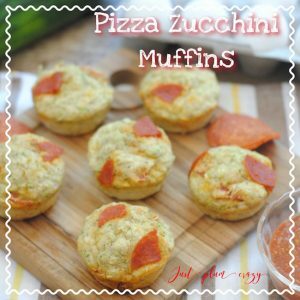 Add the shredded zucchini, milk, melted butter, eggs, cheese and pepperoni. Gently stir to combine all ingredients together. The batter will be thick. Fill each muffin well about 3/4 full with batter. Remove from the oven and serve warm with pizza sauce.